Once upon a time I worked for and eventually acquired a pretty darn fabulous collaborative women’s website called In the Powder Room. It was well-known for nearly a decade as the place to go for the hottest women’s humor, heart, and “Holy moly, did she just say that?” At our pinnacle we had over 125 contributors, and roughly 40,000 fans across our various social media platforms. Our readers knew they always had friends In the Powder Room, and they could count on us to tell them if they ever had lipstick on their teeth. After a few years though, running a collaborative website became more of a chore than a fun hobby and it just didn’t make enough (read: any) money to justify all the time and Tums it required managing, editing, and promoting other people’s writing. Even with a wonderful deputy editor (Sarah del Rio) to share the load, it just became simply unsustainable and we stopped publishing new content in August of 2016. The site remained up for nearly two more years as a digital portfolio for our beloved contributors. As of April 2018, the site now redirects here. 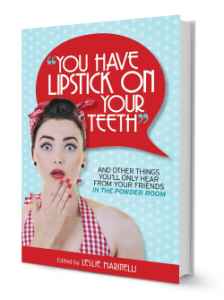 The best product to ever come out of the stalls on my watch is our women’s humor anthology, “You Have Lipstick on Your Teeth.” To this day, contributors tell me they sell out of it at every event they attend. If you need a good laugh or to just feel less alone in this world, read it.